The Medjugorje Youth Festival takes place each year in August. All events are subject to change. 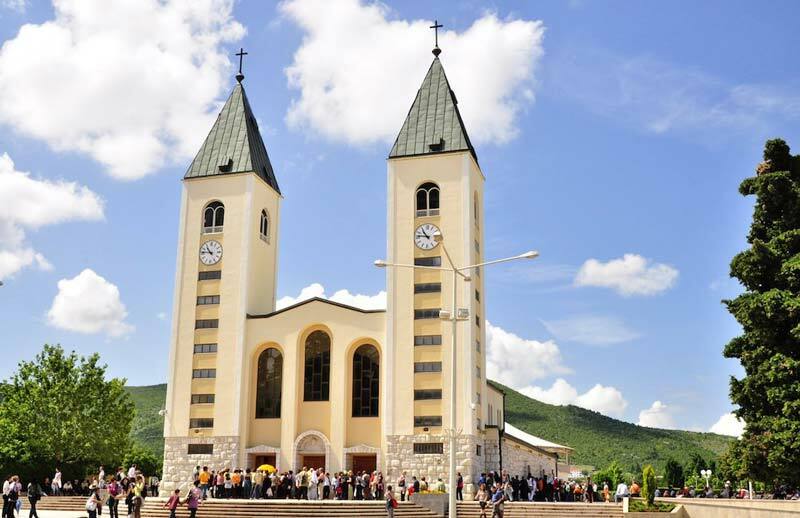 Peter’s Way Tours can customize a pilgrimage to Medjugorje for any age group and any dates. Land in Split. Transfer by bus to Medjugorje. Throughout the festival, celebrate Mass at St. James Church. Follow the pilgrim path up Apparition Hill. Pray the Rosary, participate in Croatian Mass and Blessing of the Sick. Meet with the visionaries at their homes. Climb Krizevac (Cross) Montain. Pray at “Blue Cross” at the base of Apparition Hill. Visit the community of Cenacolo, founded by the Sisters of Charity. Morning prayer. Lectures, music, and testimonies. Rosary. Holy Mass. Adoration of the Blessed Sacrament. Morning prayer. Lectures, music, and testimonies from the Cenacolo community. Rosary. Holy Mass. Theater and musical show from the Cenacolo community. Morning prayer. Lectures, music, and testimonies. Rosary. Holy Mass. Adoration of the Blessed Sacrament. Farewell celebration. Rosary while climbing Cross Mountain and Holy Mass on the mountaintop. Customize your itinerary by adding Greece, Split, or other cities and destinations.